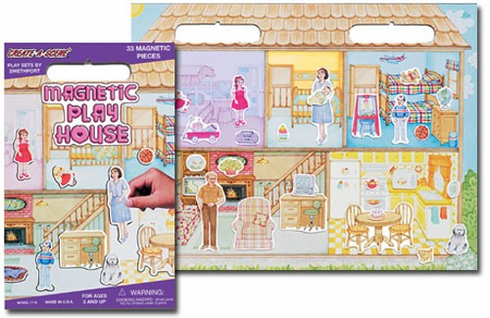 This magnetic house set features 33 magnets and a play board. Pieces include many people, furniture, decoration and pets. Smethport Toys is constantly improving the quality of their products. Recently, they doubled the magnet thickness of the vinyl playing pieces for extra hold and easier handling. All the play boards are sealed with a clear, resilient coating to make clean up easier. Each play set includes a sturdy vinyl storage pouch to help kids keep from losing pieces. The 18Ó x 14Ó play surface folds in half for easy storage. Kids will have hours of fun using their imagination as they create an endless combination of scenes. Great for Travel! For ages 3 and up This set measures 14Ó x 9Ó x 1/4Ó closed.